They don’t make droids like they used to anymore. Sure our phones are more advanced than the phones when when A New Hope premiered in 1977 but our droids can’t correspond in over six million forms of communication (yet). And although most of the characters from the franchise are pop culture icons and sci-fi staples, we noticed a severe lack in appreciation of C-3PO! It’s undeniable that his look is flashy. He went through a series of rebuilds. He was upgraded from silver to gold plating. And we’ve been teased with more changes in the Force Awakes with the addition of his red arm. We brought the galaxy from far, far away into our studio by transforming one of our own into this lovable droid. With the banning of lightsabers and weapons to the Episode VII premiere, this might just be the perfect alternative to show off how much of a Star Wars fan you really are. Watch the video to see what it takes to transform yourself! Slide the bald cap on over your head until it sits snugly and trim off excess material leaving enough so it can be glued to the skin around your hairline. Apply the bald cap with the adhesive of your choice. We used Prosaide. Make sure all of the edges are sealed. Smooth over the edges of the bald cap with liquid latex and allow to dry. We used Graftobian gold makeup. Mix the gold powder with the liquid on a palette and brush onto the face, neck and cover the bald cap. Go in with a small brush to make sure you cover the eyes completely. 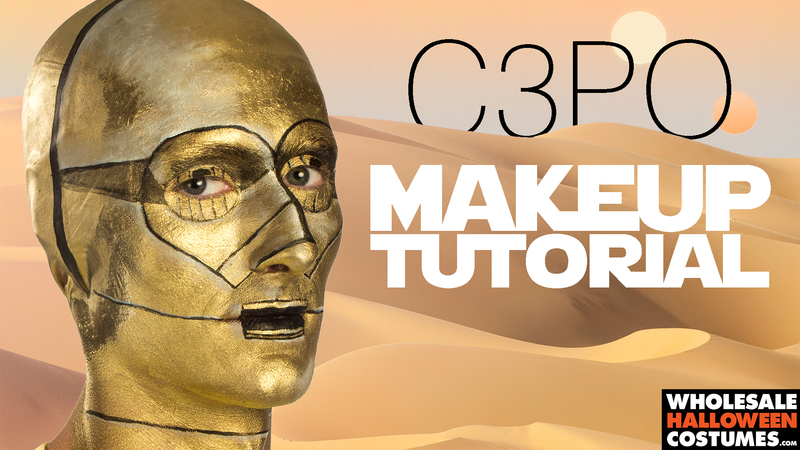 Use an image for reference to draw on the shapes of C3PO’s face. Use a thin brush with black makeup to map out the structure. Mix the gold makeup with a little black to create shadows and dimension. Paint the darker gold on the inner brows and on the temple starting at the mapped out lines and blending. Mix gold with white makeup to add highlights along the bridge of the nose. Add shadows along the sides of the nose. Draw out the mouth lines. Add more white highlights above the lines over the right eye and temple, above the lips, on the left side of the chin and on the left cheek. Extend the highlight onto the top of the right side of the head. Add small highlights around the face along some of the black lines to push the illusion of depth. Refer to your image of C3PO and continue adding highlights as you see fit. Add a black line to create the seam across the neck and highlight one side of it. All you need is a gold skin suit and you have become the droid people have been looking for! We hope the Force is with you when you recreate this SFX makeup look. And don’t forget that we’d love to see your version of this look. Show us on Facebook, Twitter or Instagram!